oz.Typewriter: Strike Me Purple! Nakajima Typewriter Hits $300! Surely world records for portable typewriter sales were set on Australian eBay tonight. A Nakajima K-Mart sold for $306! Yes, blink, rub your eyes, but you read that right: $306! One could almost afford a Remington Model 2 orchid portable for that sort of money. 1. It's a world record price for a Nakajima ALL Model 2000 (at more than 10 times the average price for a late 1970s Nakajima portable typewriter on Australian eBay). 2. 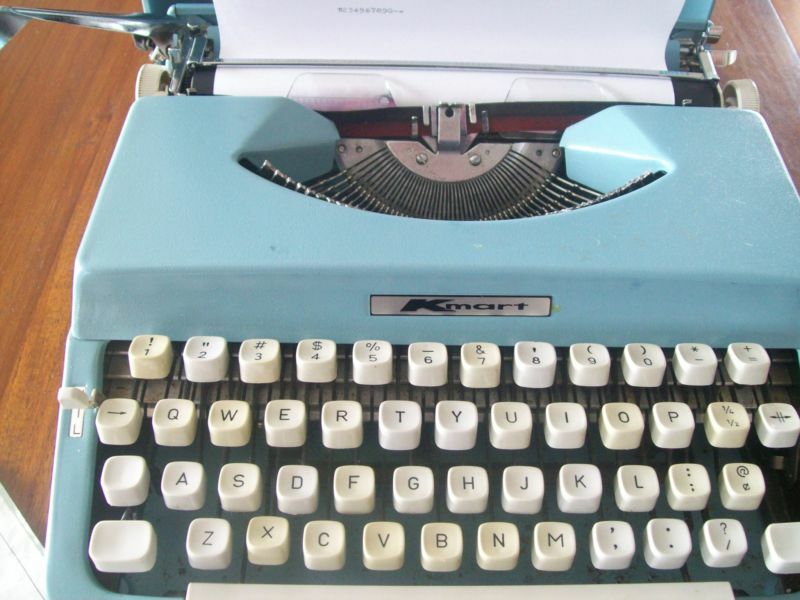 It has to be a world record for a KMart typewriter. 3. 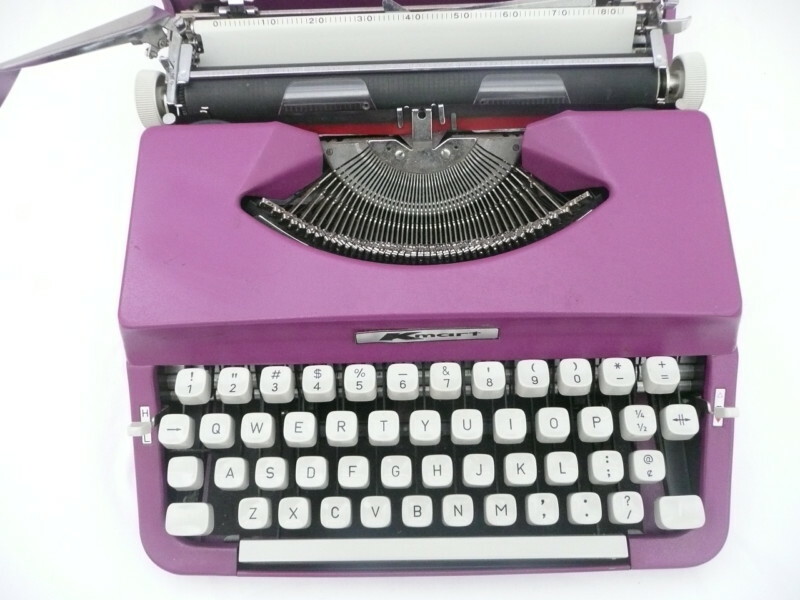 It's also probably a world record for a purple typewriter. Imagine what the Smith-Corona Skyriter Richard Polt painted for his niece would fetch on Australia eBay? I mean, Nakajima v Smith-Corona? Got to be four figures. This craziness started soon after the purple KMart Nakajima was listed 10 days ago, at a starting price of a reasonable $19.95. Suddenly two bidders went head-to-head and pushed the price up to $265. That was four days ago. For a short time the lunacy abated. Then tonight, in a final flurry, the auction pushed through the $300 barrier and ended after 20 bids. Meanwhile, another eBayer rushed to list his or her pale blue Nakajima KMart for a quick sale, no doubt figuring it was time to strike while this iron was hot. As of tonight, it had already got nine bids but was only up to $27, about the price I might be prepared to pay for a Nakajima. Typewriter madness at its worst. 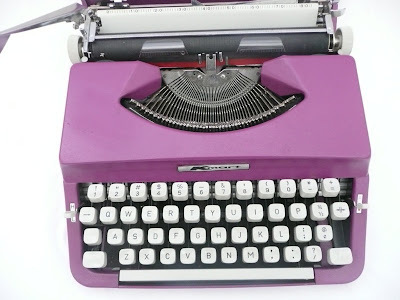 If I had $300 to spend on a typewriter, I would be buying something far less purple and significantly less Kmart. Prices in our field are really unpredictable. Which kind of keeps it fun, I guess. Thanks Ryan and Richard. The pale blue KMart is now up to $46 after 11 bids. What does anyone see in them? You're right Ryan. A Nakajima is one step up from a toy typewriter and KMart is just another Woolies. KMart sold these for $55 in 1978, brand new. Mass produced, 100,000 a month at a production cost of about $20 a machine. Gee, KMart would have loved to have been able to put a $300 price tag on them back then, but they wouldn't have sold one. Richard, I've no idea how long it took you to take apart and paint that purple Skyriter for your niece, but a Nakajima takes 3 1/2 minutes to take apart and put back together again. You will note that with all these coloured Nakajimas (orange, purple etc) the paper plate remains the original factory colour, a dull grey-fawn. There are only four other sections - the two sides, the ribbon cover and the underplate. That means six screws! They had to be that basic and simple to mass produce them at that low, underpricing cost. At one of my exhibition talks this year, I demonstrated taking apart and putting back together a Nakajima in the space of 3-4 sentences. You could have one resprayed in puce and ready for sale in less than a day. BTW, Johnny Depp used a factory coloured Nakajima (relabelled a Royal) in the movie of Hunter S.Thompson's The Rum Diary last year. I'd conceivably lift my limit and offer $60 for that particular machine, but not a cent more. I was watching this last night, and I have to say... I was equally as stunned. Absurd! Absolutely absurd. Scott, it has to be for a wedding reception or some such thing, to match the bridesmaid's dresses? But for a one-off like that, you could paint a Nakajima purple at a cost of $30 or so and put your own name badge on it. At a 10th of the price! I've seen a similar type of lunacy around here. Somehow some rather common machines are marketed as "rare", "antique", "vintage" or whatever adjective you'd like most, and go on sale for crazy prices. ... and if we don't, I'll start painting *my* spare Letteras in different shades of purple and put them on sale. Excellent points, Miguel, I hadn't thought of some of these myself. I was just thinking that you'd never be able to recoup this outlay, not even a fraction of it. With the type of machine Ryan is talking about, the value increases appreciably each day. It is very common here for people to make outlandish bids, then not pay up, claiming they didn't realise the item would go for "that much". I have a not quite working Skyriter I think I will paint purple and get some purple heat shrink to cover the platen and send it to you and see what it will fetch. Unfortunately shipping would be prohibitive so it will most likely stay on my 'it might get fixed' pile. If you really want to have a blast watch Kenwood KB-1 VFO knobs on USA Ebay. They sold new for $19.00 and I have seen them sell for as much as $500 plus! It is amazing what some things will bring on Ebay. Bill, I have a very strong feeling your shipping costs would be well and truly covered by the sale cost. Go for it! Wow. People are unpredictable and gullible creatures.